Approximately $800,000 worth of marijuana was offloaded by the U.S. Coast Guard in Miami Beach Saturday morning. "The wholesale value is about $800,000 and obviously depending on where you're buying it, the street value is a little different," said Lieutenant Lloyd Belcher, U.S. Coast Guard. The suspected smugglers went on a five hour chase with the Coast Guard and threw some of the contraband into the ocean, according to the U.S. Coast Guard. "The vessel was traveling at a high rate of speed with no lights on. 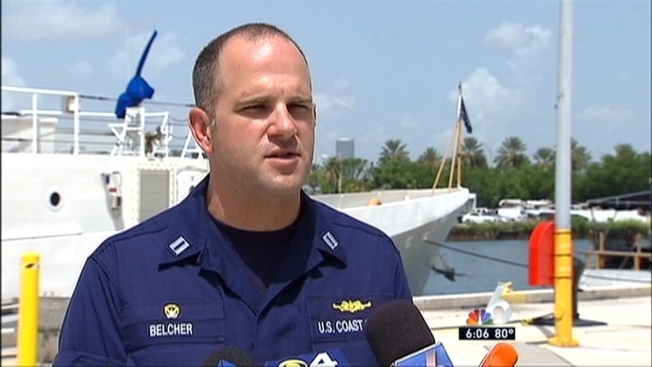 It had a profile of what we call a go-fast, that's our term for a smuggling vessel," said Belcher. Officials were unable to catch the vessel but did recover roughly 900 pounds of marijuana from the water. "No we haven't apprehended the suspects yet, but we still prevented $800,000 worth of illegal narcotics from coming into the states and that's a big hit from a business standpoint for these organizations," he said. The Coast Guard's investigation into the suspected smugglers and their vessel is still ongoing at this time.